Clovis crescent from the Fenn cache. This is the only crescent found in the Fenn cache and in fact it's the only known example ever found in a Clovis cache. It's described as having sharp edges at both ends but the middle area on both sides have been dulled by grinding. Although the known history surrounding the discovery of the Fenn cache is not what everyone would like. This crescent does seem to belong to the assemblage because it is made from the same Green River Formation chert as other artifacts in the group and it's also coated with red ochre. Crescent is the term that is most often used to describe these uniquely shaped early tool forms. But in fact, they were actually described and named Great Basin Transverse points by C.W. Clewlow Jr. in 1968. Most crescents are curved with a concave edge on one side and a convex edge on the other so the descriptive word "crescent" is most often used. Some archaeologists believe the Great Basin Stemmed Point Tradition, which is a possible source for this crescent, is either directly or indirectly connected to Clovis. Indirectly because these types of stemmed points are believed by some to predate Clovis. 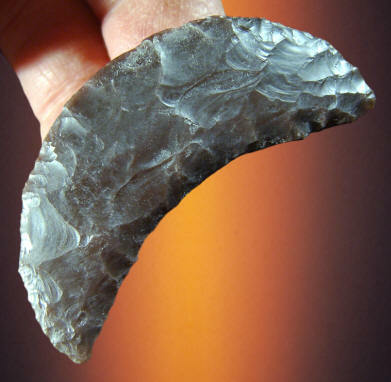 So this crescent may help to establish that the Great Basin Stemmed Point Tradition (also referred to as the Western Stemmed Point Tradition) was either contemporaneous with Clovis or possibly older than the Clovis culture. Another source describes crescents that have been found on the surface in California along with small Clovis-like points. This crescent measures 2 3/8 inches (6 cm) long. This is the only crescent that was found in the Fenn cache of 56 Clovis artifacts. It's a very well made example of a lunate crescent. Traces of red ochre was found on its surface and 54 other artifacts in the cache. This crescent was made from Green River Formation chert and it measures 2 9/16 inches (6.5 cm) long. This picture shows three views of the original crescent that was found in the Fenn cache. The Fenn cache consists of 56 Clovis artifacts that are in various stages of manufacture. The most exotic of these were three Clovis points made of quartz crystal. 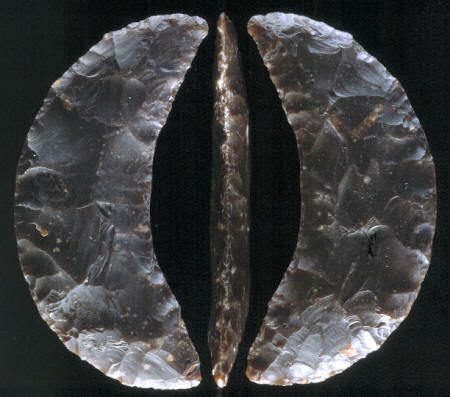 Eight of the artifacts were made of Obsidian and the rest were made of either agate or chert.